Brandi I just love how you made the little guy wiggle is tongue. When I saw it I thought he was having a good time singing his heart out. Hope you are doing okay. Whoo hoo! These are perfect! I'll save them all! Thanks soo much!! Awww I so love you.. Big Hugs to you, you are so great!! awww ... thanks, Green Eyes! Nice of you to stop by and also to leave a comment! Feel free to upload it to your photobucket and use it whenever/if you want. I enjoyed making it. Always happy to take requests! Glad you are pleased, Gizzie! I think I will stay with my little Chimp face na na na la la face .. Love the little scream face Monkey though.. Still so difficult to get all Four in one small avatar though! I wanted to pop on by and Thank-You for all your work. Nice to see you, seahorse! 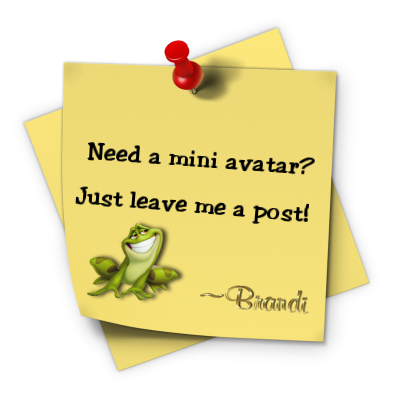 Here's a little mini avatar for you to use in your sig line if you like until our avatars get restored on the forum. In two sizes! Happy Summer to you as well! Hey, Brandi...Could you make me a patriotic Mini Me Monkey? I love your work! Thanks so much! I'll see if I can find any images of the monkey you use in order to make you one. I looked at hundreds of pages of chimps and could not find yours, so I cut your chimp out of an old avatar of yours since I don't have the original image used in your avatar. With your hand on your head, I didn't think an Uncle Sam hat worked, so I put a flag bandana around your neck in some of these. I also made you blink in some. If there is one here you'd like to use, and it is not blinking, or you want some modification to it, just let me know. First one blinks, second does not. If you had something else in mind, let me know. Happy Fourth of July and Happy Summer to you and yours! What a happy little surprise! Thank-you, Brandi. How may I ask, please, do I download the sig monkey in that space? If you have any specific problems, let me know and I'll help you with them! If you do that, I think you'll be fine. No spaces between the image code and the URL!